What do we want? Comps! When do we want them? Now! Love puzzles? GOOD! Because this week's competitions are all about puzzles! With Great British Bake-off starting again, our delicious competitions manager @YellowBelli; has organised a baking task for everyone! We all love a good cupcake but it's time to prove (ha, break baking pun) that you have what it takes to be the next Great Habbox Bake Off champion! Alongside this, our fabulous trialist Comps Staff @RoleeAnne; has posted her first competition! A little bit of Spot the Difference. Test your eyesight and attention span as you find all the differences between the two images! Or maybe you just want to share your favourite funny sayings! Well Whatever Bloats your Float would be the competition to enter! Plus, it's my competition so enter it or I'll be upset, THANK YOU. Last, but certainly not least, why not make @jamiexo; a very happy bunny by accepting her rose. Or something like that. She's offering it, it's up to you to accept it! Shut up and tell us who won last week's competitions! From 2 weeks ago, nobody won Guess Who as nobody was able to Guess who correctly! 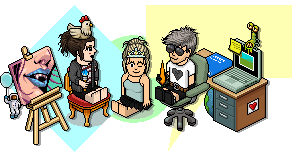 Also from 2 weeks ago, the Pet This winners were @Samantha;, @Corina35; and @Cadigyna; so well done to you guys! However, this week, @LidyaWillows; won herself some forum tokens by being chosen as the winner of Stationary Lover! Way to go, nerd! And we have also decided that @Ekelektra; has the greenest of thumbs by posting a very orange vegetable. Well done!! Unfortunately, we are still picking a winner for the "Down Memory Lane" and "Back to School...!" competitions! Tune in next week for those winners!